We’d love your help. Let us know what’s wrong with this preview of Anatomy of Movement by Blandine Calais-Germain. To ask other readers questions about Anatomy of Movement, please sign up. Seems good to use with clients and for demonstrative purposes, but there are better (dynamic) anatomy texts. It feels a little simplistic which may actually cause more confusion, especially since similar areas of the body are covered in different areas. Currently I am reading this book for a yoga teacher training course, so this review will be in the format of notes to myself for the TT. -easy to understand dra Currently I am reading this book for a yoga teacher training course, so this review will be in the format of notes to myself for the TT. -The information about all of the muscles attached to the pelvis made me wonder about childbirth and hip replacements, especially when an older person has a double hip replacement - it seems like it would be quite complicated to reattach all of the muscles during a hip replacement surgery; it also seems inevitable for muscles to rip during childbirth. -Important for yoga students to warm up their hamstrings before engaging in deeper poses. Excellent, dense and technical, this book looks at the inner workings of the skeleton, joints and muscles as they pertain to human movement. Discussions of how movement relates to organs and other parts of human anatomy are not included, which focuses the book on just movement. If you're looking for how movement can affect internal organs, look elsewhere. But if you're looking for a very thorough explanation of how the body moves, this is your book. Highly recommended for yoga students/teachers. I am reading this book again because it is just such a wonderful perspective on anatomy from a very functional perspective. It probably isn't the last time I will read it, either. I think this one is a must read for any manual or movement therapist. Another perfect book for anyone interested in movement. The descriptions of how the body works to create movement and the types of movement are detailed and easy to understand. A must-have for massage therapists and fitness instructors. This book is so informative that I am never not reading it. Wish the diagram were colored but the description and explanation is spot on. #1. Concise Book of Yoga Anatomy by Jo Ann Staugaard-Jone. #1 is Phenomenal. Lays great emphasis on all aspects of musculoskeletal system like ligaments, t Wish the diagram were colored but the description and explanation is spot on. #1 is Phenomenal. Lays great emphasis on all aspects of musculoskeletal system like ligaments, tendons, aponeurosis, nerves, etc. Have great great things about Ray Long's book but yet to read that one, maybe that can up this one. #2 is Good. Simple language. Lot of space to make notes. I use it as my anatomy notebook rather than textbook. Good diagrams, pretty broad descriptions and drawings of some portions but a great book to get the general idea. Of course other books will have more intimate explorations of singular joint/muscle mechanisms, but this book is great for the reader wanting to get a wholistic idea of the human musculoskeletal system. One of the best books for understanding anatomy from a non-medical perspective. Plenty of clear illustrations interspersed with concise and practical text to help decipher the joints and muscles of the human body. If you move, read this book! It gives you a good overview of the skeletal muscles, tendons and ligaments of the body. Nothing special, just a good overview, if you are looking for something which focuses more on a specific topic like joints or how you can train the muscles then this is not the book for you. However, I’d still recommend this to every trainer and coach, to get a general idea of where are those muscles. just the best book of movement I have read. This book is amazing. Not only is the information presented in a logical and fascinating way, but the illustrations are so incredibly good and sensitive that this is, no joke one of the two best artistic anatomy books I've ever seen. In any artistic or medical situation I make sure I have my copy of this book with me. This is seriously one of the most useful books you can ever possibly purchase. Excellent book on body mechanics. The author a ballet practitioner, provides hundreds of illustrations of anatomical parts of the body including bones, muscle, ligaments, and the possible movements for each part of the body. A great reference for anyone into sports and has a desire to better understand the body. This book is from the required reading list for my yoga teacher training class. While I haven't read the entire book (we still haven't studied the forearm and the hand), I must say this book's drawings and attention to detail make it an excellent resource for those studying anatomy for dance or yoga. The thrill-ride of the summer! Jokes aside, this is an excellent reference I would recommend to anyone. The depth of explanation and detail and the precision of the diagrams make this a volume I will surely hold onto. This book might be more of a browser that I'll revisit from time to time. It's incredibly well laid-out, discussing each part of the body and the mechanics of its movement. Fascinating stuff these flesh sacks we walk around in all day. Great book for every student of anatomy. I love illustrations - easy to undestand with them. I can highly reccomend this book. You will learn not only basic anatomy, but also how body works in movements. Great source for every personal trainer!! This is a wonderful anatomy book. It was written for dancers to help them avoid injury, but it was brought to my attention by a physical therapist and I find it helpful in my art for understanding human movement. Recommend by my pilates instructor. Flipped through it and it looks AWESOME. Thinking of ordering it from B&N, I want to have it, and it's not available from the library. 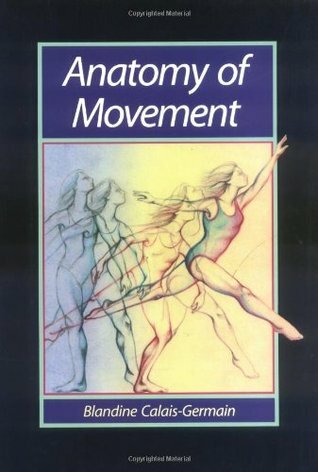 This book was written by a dancer for dancers - it is a great book for anyone interested in movement as it shows the muscles as they 'are in motion'. Terrific reference book! consume slowly as it is dense. Great reference text for yoga. "Short, deep muscles (e.g., those inserting on the vertebrae or foot bones) tend to be responsible for precise, small-scale adjustments rather than gross movements." very helpful in my Feldenkrais sstudies. A great reference for understanding anatomy and muscle structure. Great need-to-know guide. Use this when studying pilates and yoga. Excellent reference tool when used with a more traditional anatomy book. I'm re-reading this in preparation for more Pilates training. Great book for those who want to know more about the anatomy of movement! I've used this book twice--once in art class, and once in dance class. It's not fantastic, but it clearly illustrates the basics of movement.